Haryana Steelers team had their first taste of PKL in season five held in 2017. The Haryana Steelers are the second team to represent northern India, the first being Dabang Delhi K.C. Season five saw them qualify for the playoffs and the team finished with a commendable 6th place on the table. Nevertheless, this is a team that has much to bring to the mat. The Haryana Steelers showed clear signs of brilliance and locked horns with the biggest names and teams in the PKL. The team has have performed consistently throughout season five and have been particularly feisty during their home games. A strong team spirit and surprising victories are to be expected during any match with the Haryana Steelers. As they go into season six, they are surely looking to aim higher on the leaderboard. The team made their goals clear for season six at the PKL auction with a flamboyant display of big spending. A first in PKL, the team paid a staggering Rs 1.50 crore to acquire captain Monu Goyat, making him the highest paid player in PKL history. A closer look at the Haryana Steelers 2018 team reveals a strong lineup of players making this one of the teams to beat in season six. Haryana Steelers owner is the billion-dollar conglomerate JSW group and Rambir Singh Khokhar is the Haryana Steelers coach. Haryana Steelers Captain Monu Goyat is also an army man and has been playing kabaddi since the age of nine. He missed the chance to play in the PKL season of 2015 but he changed his fortunes with an impressive display of skill when playing for the Bengal Warriors and the Patna Pirates. Goyat finished season five as the fourth most successful raider in PKL and was second highest in the tally for most Do-or-die raids. Raider Vikash Khandola is a future star who has made a big impact in the game with his impressive agility and ability to carry the team to victory. He scored 44 raid points in 7 matches in season 6 as of now, making him the best raider in his team Haryana Steelers. Former captain Surender Nada has been ruled out for the season with an arm injury. This is a huge blow to the team who will look to make up for his absence. All-rounder Kuldeep Singh has been retained and his experience with the team will be valuable as he embarks on his second year in the PKL and the Haryana Steelers squad. Kabaddi veteran Wazir Singh has been consistently making his mark in the sport with impressive scores, by finishing as the top raider for his team in seasons one, two and five. Duels between the Haryana Steelers and Dabang Delhi K.C. are a rivalry to be followed as they take the mat to find out who is the best from the north. The Haryana team has a strong line up of raiders, but the defence department may be a bit faulty. Only time will tell if their splurge on a single player fails to strengthen other areas of the team. If you have got the vision to become a team manager, put your skill to the test with Dream11. Play as a selector online on Dream11 and experience the thrill of a vibrant online sporting experience. 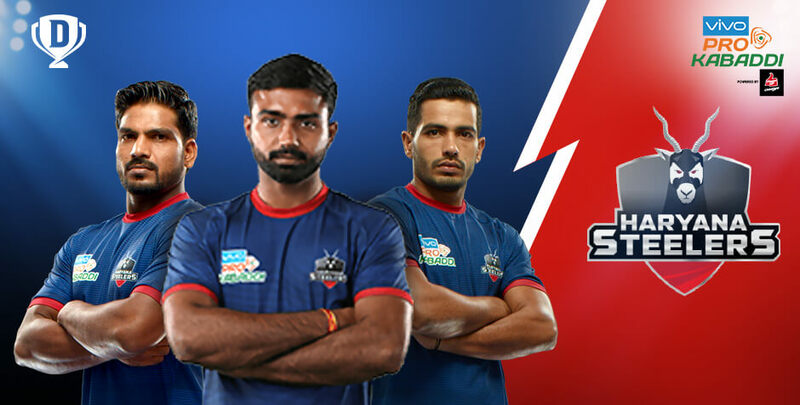 Make your picks for the best raiders, defenders and all-rounders before every game and stand a chance to score up to some sweet wins during Vivo Pro Kabaddi. Play solo for fun or take it a notch higher and invite your friends to a challenge. Test your game skills with the many contests and mega contests and indulge in the coolest fantasy sports experience with Dream11 via the official website or mobile app.